« Welcome to Dirt Cheap Wine Country! The art of getting a deal on a rental car is complex enough that I figured it warranted its own blog post. For the wine country traveler looking to save a buck, renting a car can be maddening. Over the past few years rental car companies have been steadily raising their rates; gone are the $16-a-day Thrifty specials. Fortunately, there are still a few tricks of the trade you can employ to save a bundle. 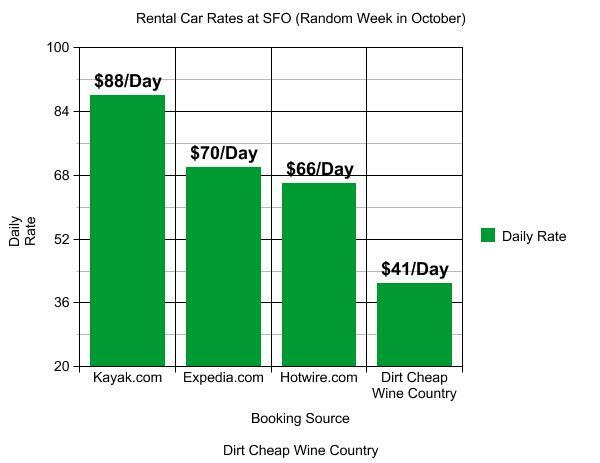 At Dirt Cheap Wine Country, we’re able to reliably get our cars down to half of what Kayak, Orbitz, and Expedia are quoting, and we can often beat Priceline! Loyalty Programs will save you from waiting in a long line at the rental counter, and put you on the list for members-only coupons. They’re also the ticket to free upgrades, so it’s worth the time to sign up. Car Size: book the smallest car you think you can get away with. Gas is expensive, rural wine country roads can be narrow and winding, and winery parking lots are often a tight squeeze. Be aware that cases of wine rapidly fill up trunk and back seat space, so consider a mid or full-size car if you plan on buying a lot of wine. Car Color: the lighter the better. Dark cars absorb more heat, which puts your wine at extra risk of cooking. If you’re pre-assigned a dark colored car, a polite request to change to something lighter is rarely denied, especially if you’ve already spotted something on the lot and can given them the parking stall number of the car you’d prefer. Discount car companies: Stick with one of the “majors” (Alamo, Avis, Budget, Dollar, Enterprise, Hertz, National, Thrifty). The regional guys often have lower rates, but their reputations can be less than stellar and their locations are airport-only. You’ll be doing a lot of driving in remote areas, so you want a company that will work with you if you get into a jam and has a neighborhood location nearby. The first (and easiest!) step to securing a cheaper rate is to see who you’re already affiliated with. USAA, AAA, and Costco are known for having some of the most generous discounts, sometimes as much as 30%. Often, additional driver fees are also waived. Government employees and contractors, even on leisure, are often eligible for Government rates. If you work for a large corporation, odds are your corporate travel department has pre-negotiated rates, and they are nearly always valid for personal travel. (You may have to ask your HR department for the rate code). Airline, Hotel, and Credit Card programs also often offer aggressive discounts to their members. Rental car coupons are nearly always digital. Often they are listed on the rental car comapnies’ web sites (or, for AAA/USAA/Cosctco members, through their respective travel portals.) More obscure coupons can also be found on Internet message forums such as Flytertalk.com and FatWallet.com and are e-mailed to loyalty program members. Old-fashioned paper coupons are also printed in the nationally-distributed Entertainment Books. Carrentalsavers.com is another particularly useful coupon finder. Most coupons rotate out on a quarterly basis. It is often possible to “stack” coupons on top of association/employer discounts, allowing you to receive a double discount! While most rental car sites are pretty straightforward, some have multiple boxes in which to enter a discount code; you may have to do some finagling to get the appropriate code into the correct code box. This is a trick that was only recently pointed out to me. At ultra-major airports such as LAX, some of the larger nearby hotels will have a rental car office inside the hotel. Their rates may or may not be any cheaper, but since they’re not technically at the airport they usually don’t charger the expensive airport taxes. Upon arriving at the airport, catch the appropriate hotel shuttle rather then the rental car shuttle and complete the rental at the hotel. If you’re traveling with several people or lots of luggage, I’d recommend leaving at the airport while you go fetch the car. Some hotels will even allow you to return the car to the airport for free, while at other locations this will trigger the airport taxes. Try changing the return location to the airport when you book to see if this applies. Rental car companies are desperate to unload their cars on weekends, so if you’re taking a weekend trip, Hertz and Enterprise both offer weekend specials – usually in the ballpark of $10-$15 per day. Often the most aggressive coupons and discounts are also applied to weekend and/or weekly rentals. These are few and far between, but there are a couple worth noting. While not a trick for the novice traveler, some people have reported great success using the rental car companies’ own foreign sites (ie. budget.co.uk vs. budget.com) for domestic rental booking. This works by taking advantage of currency exchange rates as well as specials designed to attract foreign visitors to the US. Sometimes the rates are cheaper, and since they’re quoted in foreign currency the conversion may work in your favor. This is especially useful for folks with an overseas address. Be aware that if you have a US address your reservation MAY be rejected. Also be aware that some of these rates include insurance for which US residents are not eligible. AutoSlash.com offers a terrific service for the Dirt Cheap Traveler (we’re not affiliated, we just love ’em!). Once you book your reservation, you can plug the details into their web site and it will re-shop your reservation daily.. If the price drops, they’ll send you an e-mail with instructions on how to re-book. On our last trip, AutoSlash found a promotion that saved us over $30 on a 4-day rental! Priceline/Hotwire reservations cannot be canceled or changed. The other tips outlined above can often yield a comparable rate. However, there is the occasional trip where they’re the best option. On a recent trip to Napa, the San Francisco airport was completely sold out of cars. Priceline came through at $30 a day when, even with the best of discounts, $70 a day was the lowest price to be had anywhere else. I hope you find this guide useful. If you have any other tricks you’ve picked up as you travel, put them in the comments and we’ll include them in the next revision! This entry was posted on June 16, 2014, 2:10 pm and is filed under Wine Travel. You can follow any responses to this entry through RSS 2.0. You can leave a response, or trackback from your own site.